Are you one of the many homeowners working to green up your home this year? Chances are you’ve started looking at the one major item that every homeowner can work to improve on – water conservation. By far water is the thing we use most in our homes; and it’s the one thing we can improve the most as well. Let’s look at some easy water conservation tips you can do here in Colorado to improve your efficiency. 1. Replace or fix old dripping faucets. A dripping faucet can waste as much as 150 gallons of water each day, which adds up to over 4,500 gallons of water per month. This one item alone will impact your water bill each month. 2. Replace old shower heads. New shower fixtures provide water saving features without cutting back on spray. 3. Toilets are one of your biggest water users – and water wasters. There are a variety of water saving toilets on the market today that use as little as 1 gallon per flush. Also check and replace old fill valves, which will help keep your toilet running efficiently. 4. Reduce the amount of detergents, bleach, cleaners, and other chemical products you use within your water supply. These products can kill the natural bacteria in your septic system, and leave chemicals within your water supply. Use biodegradable soaps and detergents whenever possible. And for green drain cleaning solutions, check out Green Approaches To Drain Cleaning. 5. 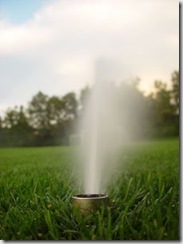 As summertime watering approaches, re-evaluate your sprinkler system. If you use a hose, consider purchasing a spring-loaded timer that attaches directly to your faucet, and prevents over-watering if you forget to turn it off. If you use a sprinkler system, consider reworking your sprayers for your changing landscaping. As trees and plants grow to different heights, they need different watering sources. Also consider a rain gauge timer to prevent automatic timers from turning on the water in the event of rain.